Man has spread across the world as a wandering being. In tens of thousands of years of human history, he/she has always moved, departing from Africa. Wars, conquests and expulsions dating back to prehistoric times, have triggered flight migrations. Even the oldest historical and literary sources report of flight and expulsion, of the loss of the ancestral homeland felt as catastrophe. In my work Now I am gone, and I did have a name, the names of 105 of the probably over 300 people who drowned off the coast of Lampedusa on the night of Thursday 03.10.2013 appear. Since the 1990s, more than 200,000 people from Africa and Asia have been fleeing civil war, hunger and misery in Lampedusa. It is estimated that ten to twenty thousand people lost their lives in the same period. Despite all the statistics, it is easy to forget that for every number there is one person, with a name and a story, who has spent his family's savings to escape poverty, war and lack of opportunity and put his life at risk. As long as people in their home countries have no future or cannot be sure that they will survive the next day, they will continue to go where living conditions are better, or at least where there are opportunities for a better existence. 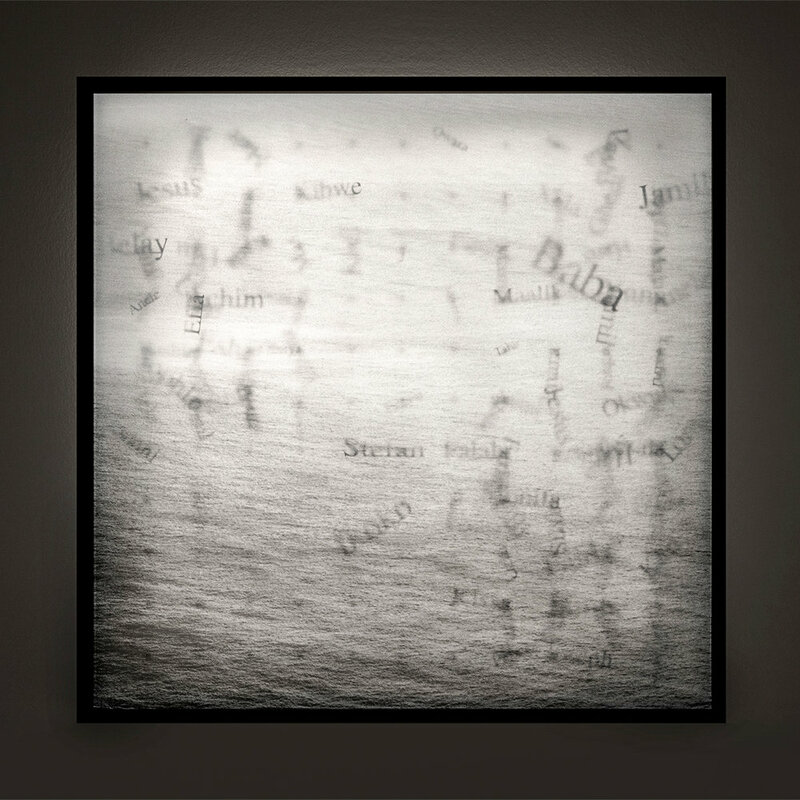 The work is designed in such a way that names inside a lightbox seem to float below the surface of the water. They represent the many other fugitives who may have had the same age, the same name and whose bodies are in the same place at the bottom of the sea. 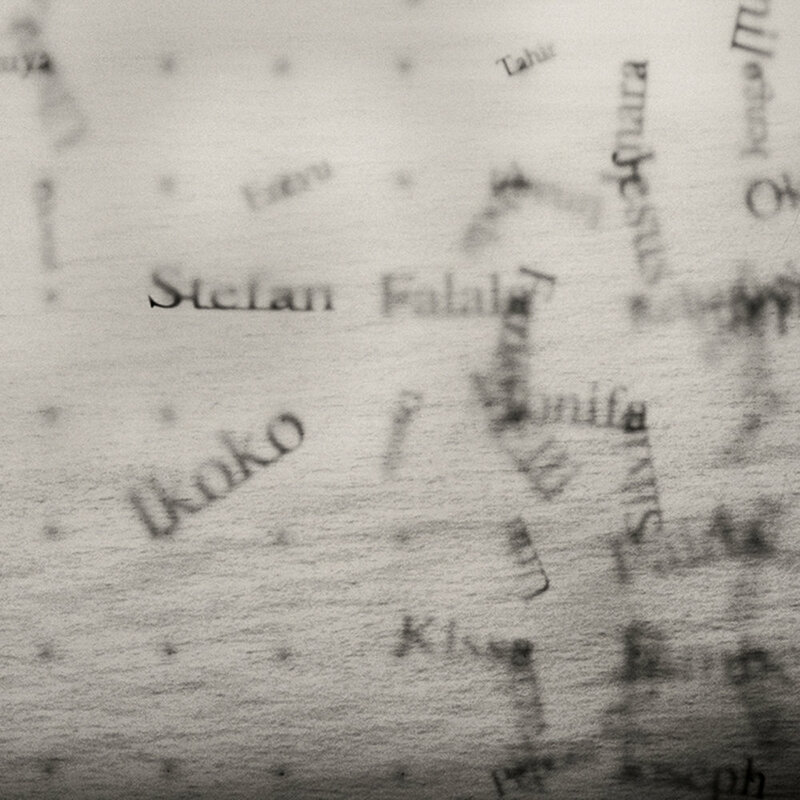 The names of the victims, I got in the context of a temporary art action initiated together with other artists, which took place on 2 December 2013 in Brussels in front of the European Parliament. Only one metal box, hanging among the others, represents in a metaphorical way the 1% of the population, to which half of the world's wealth belongs. This leads us to think about the actual world order. The work deals with the uncertainty of human conditions connected to the acceleration of globalization, the legacies of colonial occupation throughout the world, and the control exercised by the private industry, which is causing global inequality. All those aspects lead to the question, why inequality is so difficult to overcome. To find an answer, Adrian Bejan, Professor of Mechanical Engineering at Duke University discovered the Constructal Law, in which physics can predict wealth inequality. Bejan's Constructal Law addresses the fundamental principle of physics that underlies the evolution of flow systems as they change in design over time to increase flow access. It reveals that flow patterns govern the structure of the entire universe—most clearly evident within rivers, neural networks, lightning bolts, electrical circuitry and trees. Every flow architecture on Earth follows the same order, which is a natural tendency to want to flow more easily. "The Constructal Law extends the power of physics over all of the phenomena of evolutionary design and organization, from geophysics to biology, technology, and social organization,"
“The annual wealth, gross domestic product (GDP), is essentially proportional to the useful energy or 'work and movement' generated by a group or territory, so we can think of wealth as movement. Also recognize movement (wealth) as inequality that is hierarchical." This finding is "pivotal for physics, because it shows that the economics concept of wealth has a physical basis, which is measurable as work, fuel consumed, or movement effected by fuel, food, and work" "This unites economics and physics. The equivalence between wealth and movement is evolutionary because wealth and fuel use are increasing over time." Even if Bejan's Physical Law describes the phenomenon of global inequality in a comprehensible way, human actions can change this law significantly. From a humanist point of view there is nothing natural about extreme inequality, it is man-made, and it has to do with power. From this point on, the work could also refer to Bertolt Brecht's play Die Dreigroschenoper, in which social conditions ultimately determine people's actions. The installation How Much is Enough attempts to illustrate also the inequality between countries, which has been increasing by orders of magnitude over the past two hundred years, and shows no signs of slowdown. As long as a few rich countries have the power to set the rules to their own advantage, inequality will continue to increase. Growth has been the main object of development for the past 70 years, despite the fact that it can’t work for all. Growth is not an option any more, we have already grown too much. We are blowing past planetary boundaries at a high speed. And the truth is that the global crisis is almost entirely a result of overconsumption in rich countries. Instead of pushing poorer countries to “catch up“ with rich ones, we should be thinking of ways to get rich countries to “catch down“ to more appropriate levels of development. In order to achieve that, we have to reach a higher level of understanding and consciousness about why we are on this planet and what we want to do with it.